and would buy bushels to "put by" for the winter. For she kept me supplied with jars and as I emptied one, a full one would find it's way home with me. But I knew it was made from garden produce. 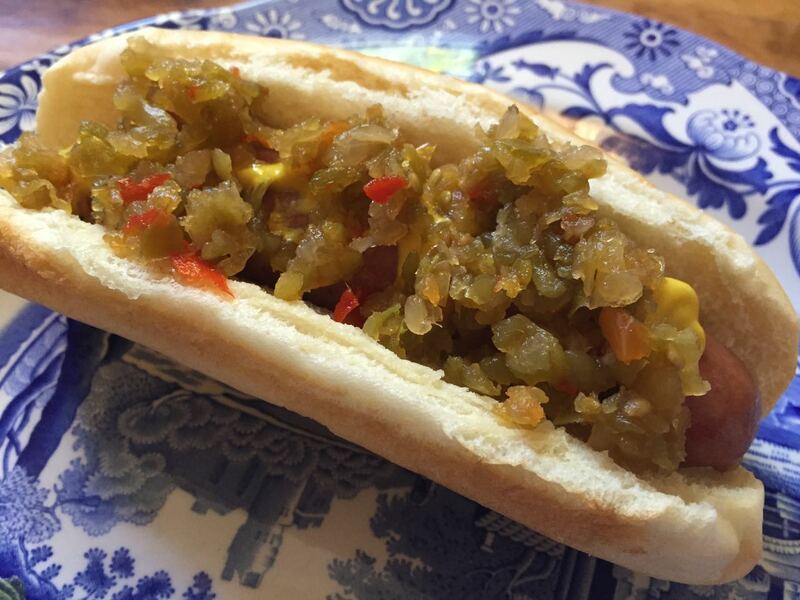 I never took a liking to store relish. But it just didn't taste right! And then the search began . 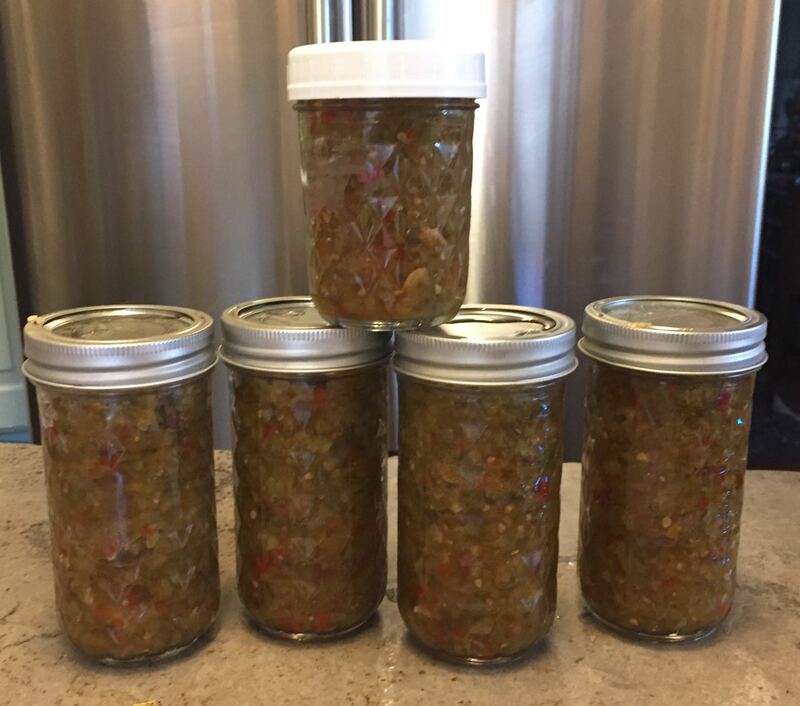 . .
Piccalilli yielded recipes which included cabbage and other things. And she never grew cabbage. And it, too, was called piccalilli! made me think that I had finally found Mother's recipe! And what did we have for lunch the next day? for unless you grow them, green tomatoes are hard to find! Combine the chopped vegetables and salt in a large stainless steel pan. Cover and let stand in a cool place (about 65° tF to 70° F) for 10 to 12 hours, or overnight. Pour the vegetables in a colander over the sink and let drain. Rinse with cool water and use your hands to squeeze out any excess liquids. Tie the pickling spices and celery seeds in a cheesecloth spice bag. In a large stainless steel or enamel-lined pan, combine the vinegar, the spice bag, chopped garlic, and the vinegar. Put the vinegar mixture over high heat and bring to a boil, stirring until sugar is dissolved. Add the drained green tomato mixture and bring the mixture to a boil. Reduce heat to medium-low and boil gently, stirring often, for 1 hour. While the mixture is cooking, prepare the work area, canner, jars, and lids. See Preparing Jars for Canning and Boiling Water Processing. Fill hot, prepared jars and remove any air bubbles with a small plastic spatula, leaving 1/2-inch headspace. Clean jar rims and fit with lids and rings. Process in a covered boiling-water bath canner for 10 minutes. Turn off heat, remove the cover, and let jars stand in the hot water for 5 minutes. Remove to a rack to cool completely. 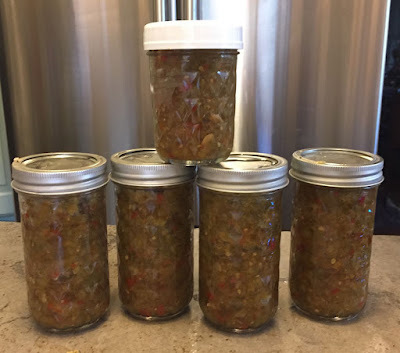 Makes about 7 half-pint jars of relish. IT'S FRIDAY AND I'M SHARING MY RELISH WITH MICHAEL AT RATTLEBRIDGE FARM FOR FOODIE FRIDAY! Ed's Mother, Mary, always made Piccalilli!!! We loved it so much, I've been known to eat a teaspoon full right from a freshly opened jar!!! Thank you for sharing the recipe you found closest to your Mothers!!! Wishing you a wonderful weekend ahead!! !